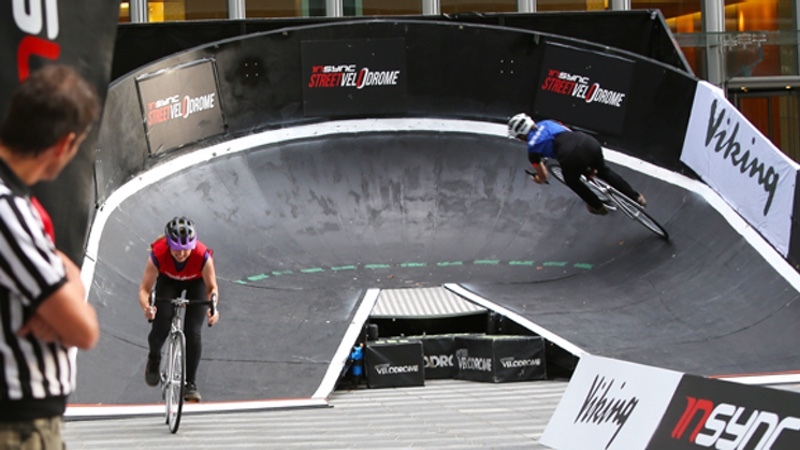 Heading from the UK to Australia, the urban biking experience StreetVelodrome UK will give cycling fans a new participation opportunity in the City of Adelaide Tour Village at the upcoming Santos Tour Down Under. The Santos Tour Down Under is an 11-day festival of cycling, running from 10-20 January 2019. It commences with the Santos Women’s Tour Down Under from 10-13 January, followed by the Down Under Classic (13 January) and men’s Santos Tour Down Under from 15-20 January. Minister for Trade, Tourism and Investment David Ridgway announced the new initiative on Monday’s month-to-go mark before the start of the Tour. “With all the necessary equipment including helmets and bikes provided, along with expert individual coaching, this is a once-in-a-lifetime opportunity for cycling fans to ride on a velodrome-style track,” said Minister Ridgway. StreetVelodrome UK Series Director Carl Thompson said the opportunity to take the concept down under at the opening UCI WorldTour race of the season was a logical decision. He said, “We are thrilled to be part of the Santos Tour Down Under and bring the track to Australia for the first time. Registrations for ‘come and try’ sessions, kids and open-age races will be announced via the Santos Tour Down Under team over the coming weeks. The Santos Tour Down Under is the opening UCI WorldTour event running from 10-20 January 2019. The City of Adelaide Tour Village opens on Saturday 12 January.